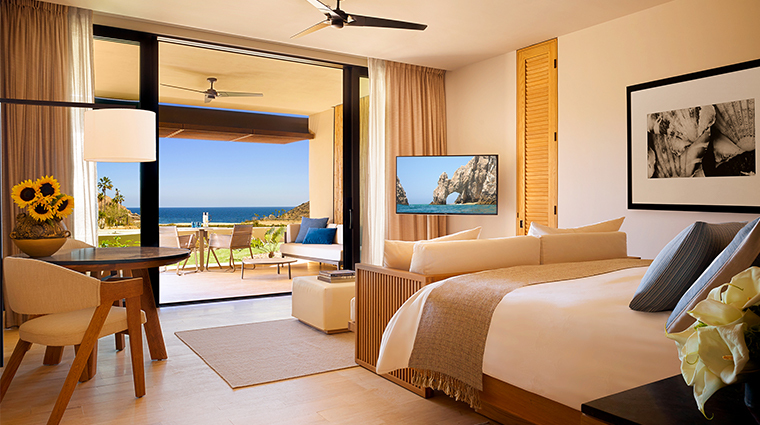 If you're craving contemporary design, championship-caliber golf and crystal-clear ocean views, check into the picturesque Montage Los Cabos, where the Discover Baja offer lets you linger longer in sun-drenched luxury. 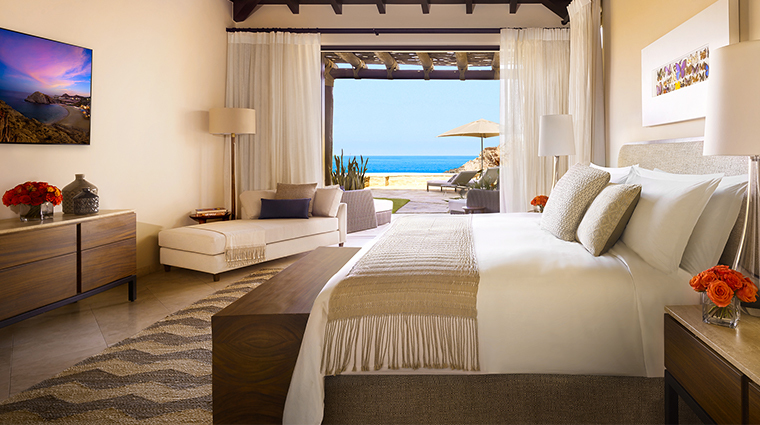 Book a three-night stay in waterfront accommodations and bask in a gratis fourth evening, providing just enough time to luxuriate in the 40,000-square-foot spa, savor sublime Mexican cuisine at Mezcal or sneak in a dip at one of Los Cabos' only swimmable beaches. You'll also receive a $70 daily breakfast credit and round-trip airport transportation. Subject to availability. Four-night stay required. Enter promo code PKGDIS. 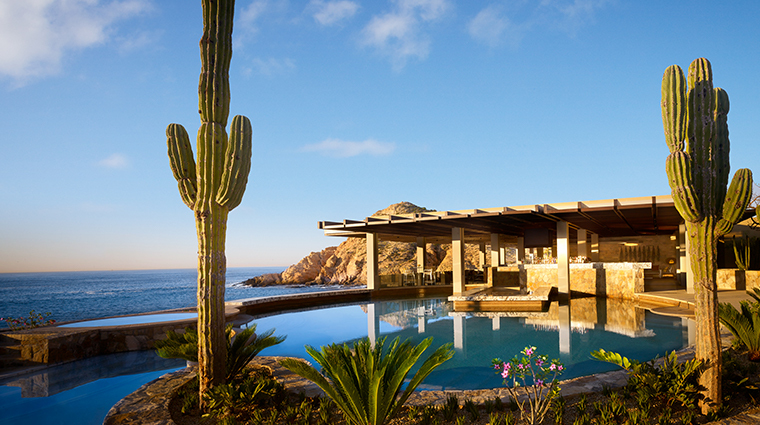 There’s no improving upon the setting for the new Montage Los Cabos. 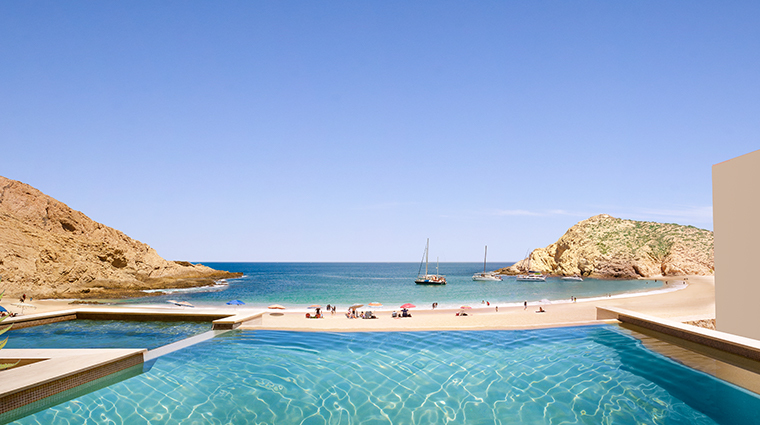 Perched on a gentle slope overlooking a gorgeous golden sand beach in a protected cove, with waves breaking cinematically onto the shore, the resort benefits from one of the most magnificent locations in Los Cabos. Give Montage credit, though. 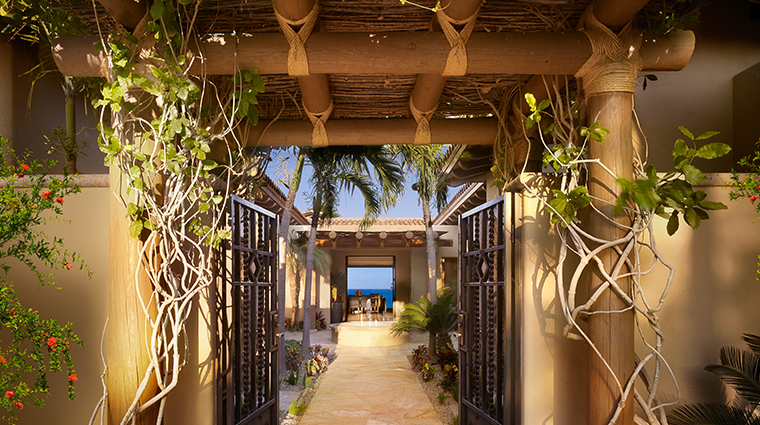 The brand has maximized the surroundings for its first property outside the U.S., pairing the stunning views of Bahía Santa María with chic, ultra-luxe beachfront accommodations. 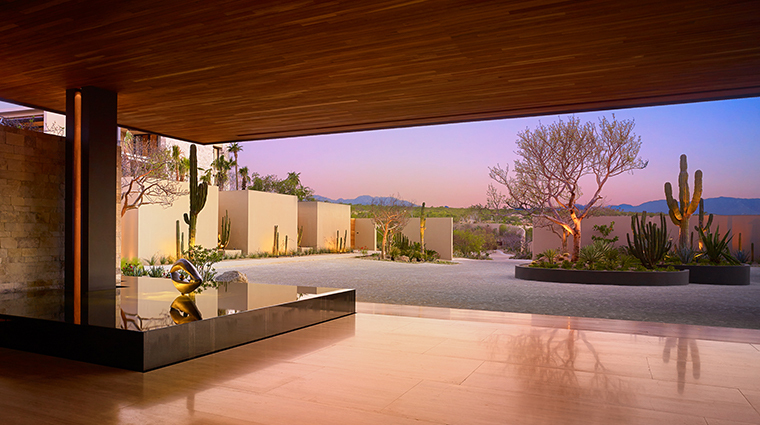 The 122 rooms and 52 residences showcase graceful contemporary Mexican styling, a seamless flow from indoor to outdoor spaces, and a rather elegant simplicity; the latter characterized by a chameleon-like design pattern in which the resort seems to merge with its picturesque environs. 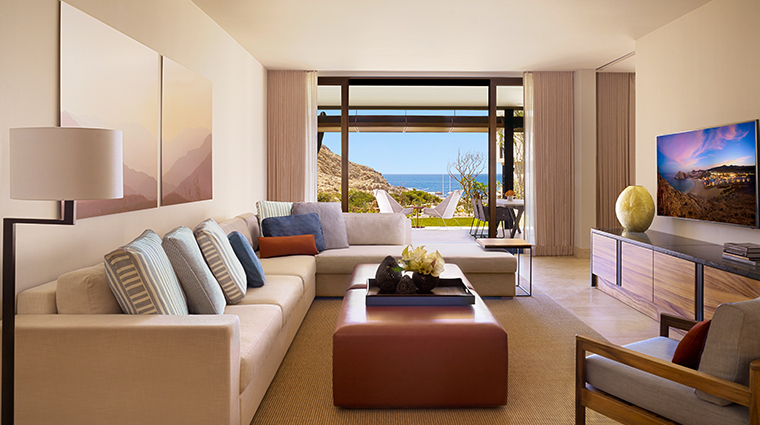 The amenities, too, are memorable, and include the largest spa on the Baja California peninsula, as well as a brand-new golf course designed by former Masters Tournament champion Fred Couples. 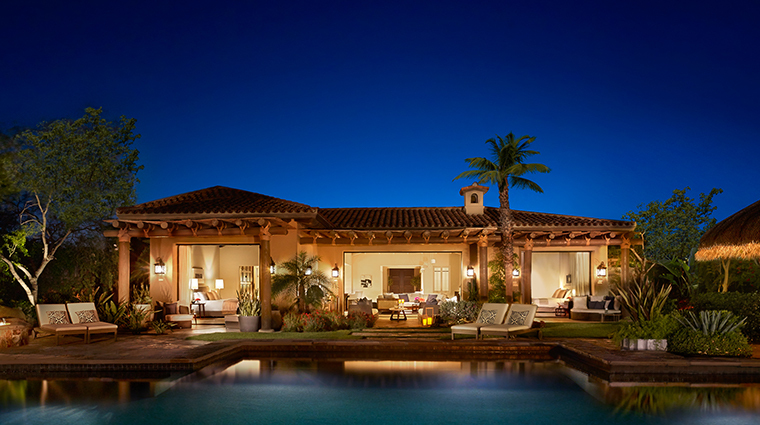 The Los Cabos hotel is a haven for golf lovers, featuring the Twin Dolphin Golf Course that is exclusively available to Montage guests and residents of the adjoining Maravilla residential community. 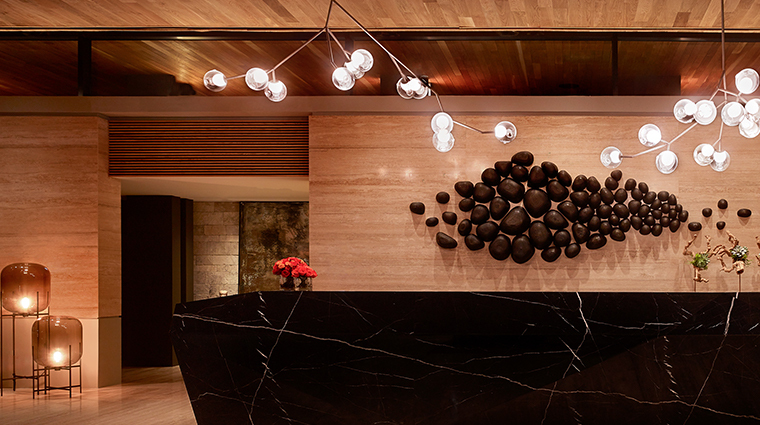 The expansive 40,000-square-foot signature spa is the largest in a region famed for its world-class wellness facilities. 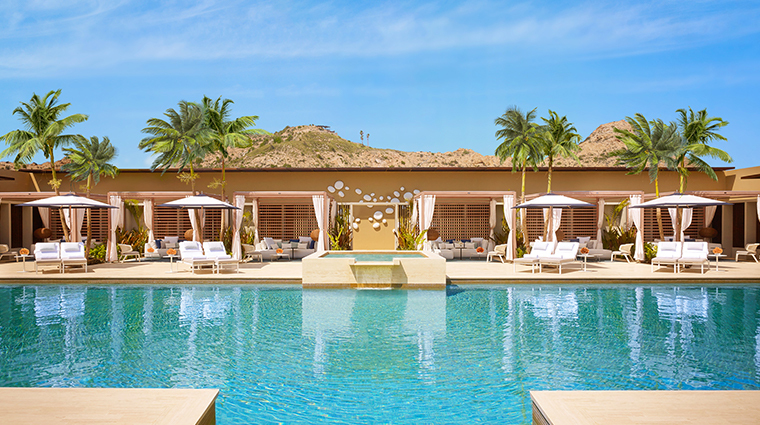 Spa Montage Los Cabos boasts 12 pampering treatment rooms, an enormous central serenity pool and an onsite boutique stocked with top-notch beauty products, among other soothing features. The property prides itself on creating uniquely curated experiences to help you explore the region. Simply ask the concierge to set you up on exciting excursions such as deep-sea fishing, desert camel rides or a swim with whale sharks. A pristine horseshoe of soft sand surrounds calm, crystal-clear ocean, making Montage a paradise with swimmable beaches — a rarity in this area, as most resorts here perch up against dramatic rocks and crashing waves. Three pools are scattered around the grounds, and are differentiated not by age designations, but rather by setting and scenery. The large lower-level infinity pool affords lovely views of the bay, for instance, while the spa-based serenity pool is tops for privacy. 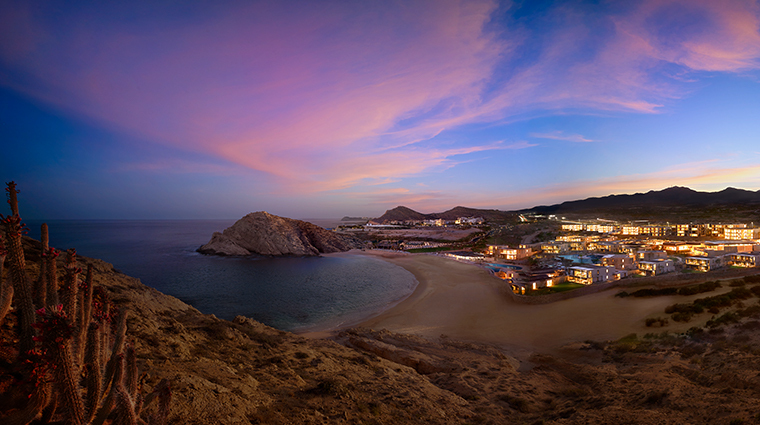 Montage Los Cabos is nestled on 39 acres fronting Bahía Santa María and the Sea of Cortez. The beach, also called Santa María, is one of only 53 in Mexico to receive an internationally recognized Blue Flag certification formeeting stringent environmental standards for cleanliness, water quality, safety, services and sustainability. Don’t worry about finding ways to occupy your little ones’ time. 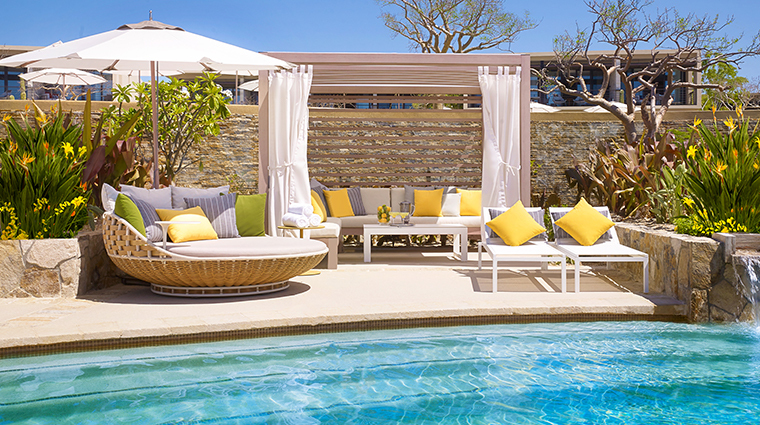 Paintbox, the resort’s activities program for ages five to 12, offers arts and crafts, games and other supervised fun-filled diversions so you can sneak off for some well-deserved alone time. 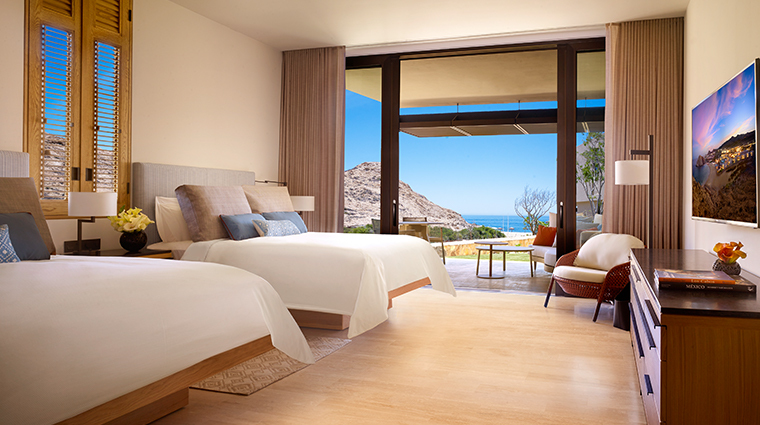 All guest rooms and residences at Montage Los Cabos have at least partial views of the Sea of Cortez, and most claim awe-inspiring panoramic vistas of the bay and beyond. Accommodation options range from cozy rooms and spacious suites to a deluxe townhouse and standalone two- and three-bedroom casas. The two-bedroom Presidential Suite, atop the luxury ladder, welcomes you with 2,695 square feet of beachfront splendor, including your own private pool. 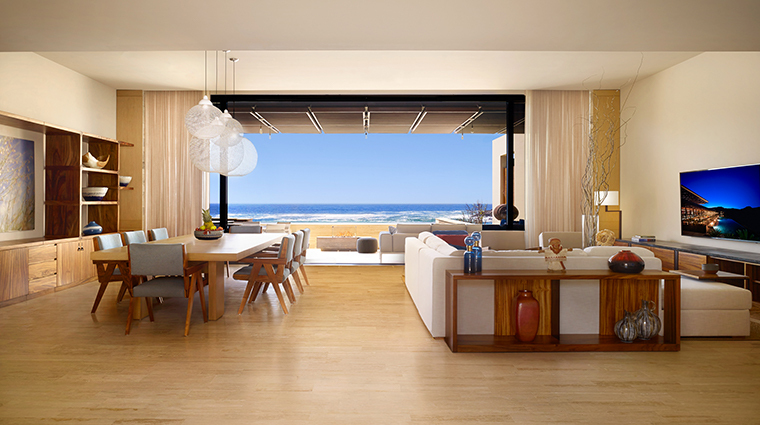 Bring the beautiful ocean breezes into your luxe living space with the custom floor-to-ceiling glass wall. Built into every accommodation, these massive sliding windows open up to expansive patios, great for relaxing with your morning coffee. Buildings have only four rooms or suites each, an intimate approach that’s good for couples or families traveling together. Larger groups will want to rent one of the residences to take advantage of a full kitchen. 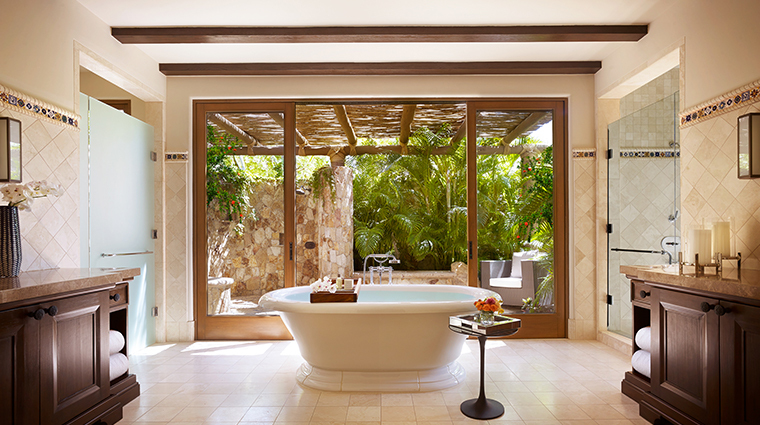 Even the bathrooms are luxurious, with oversized soaking tubs, double sink basins, and both indoor and outdoor showers. 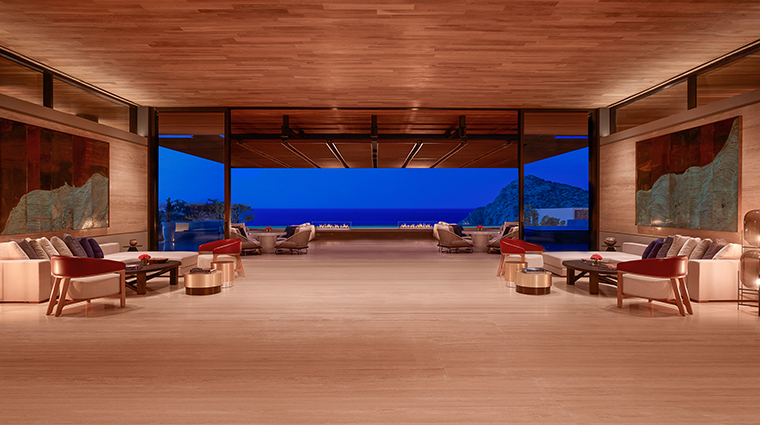 The lobby is one of the most impressive in Los Cabos — a sleek and minimalist area that opens onto a broad terrace overlooking the bay. 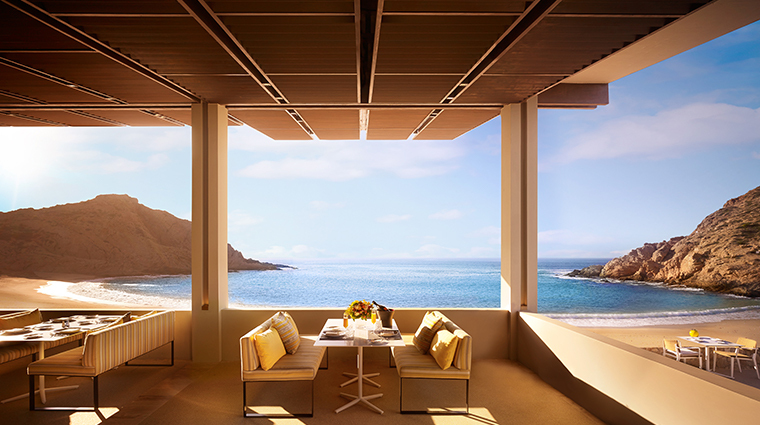 The patio delivers breathtaking vistas of the entirety of the property, with building levels cascading down toward the sea like a Cubist waterfall. 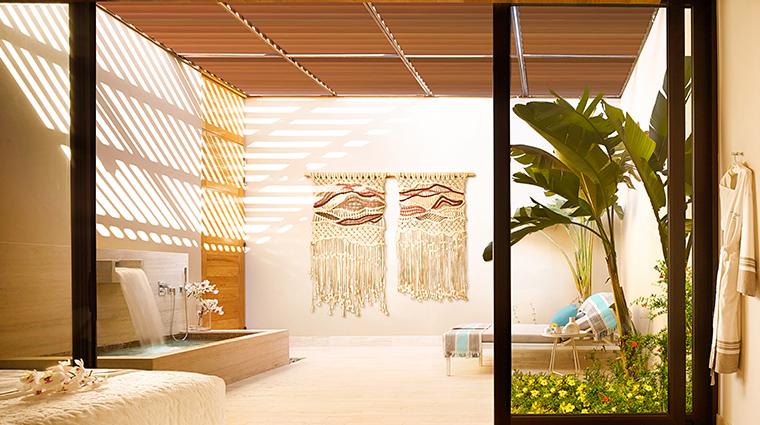 Interior design from Mexico City-based firm Bernardi and Peschard exhibits a light tropical color palette and a smooth flow from indoor to outdoor living spaces. 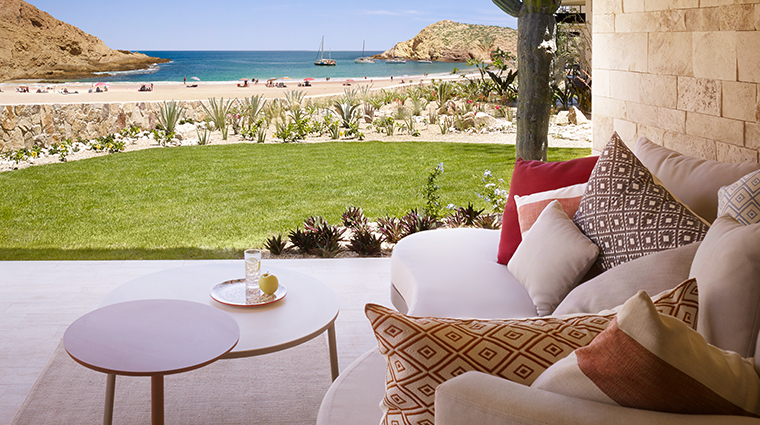 Patio daybeds, for example, allow you to enjoy breathtaking views and fresh sea breezes. 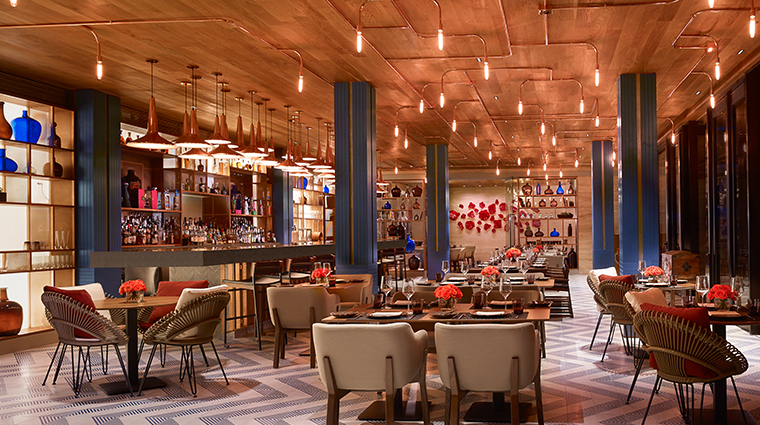 An eye-catching contemporary design rich in copper accents and bold geometric patterns distinguishes Mezcal, the luxury hotel’s signature onsite restaurant. Chef Alexis Palacios’ creative approach to traditional Mexican cuisine is also a feast for the senses.